What's ARFE like out of its managerial chair, and what's Team ARFE-SmartWool like out of its CW-X and SmartWool baselayers? 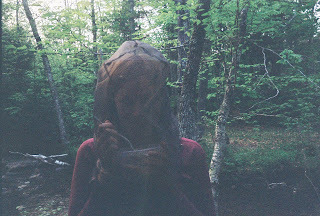 We all got a chance to find out this past long weekend, in the woods of New Hampshire's White Mountains. Team ARFE-SmartWool members Chris Edmundson, Kathy Rowe, Jeff Rowe, and Jim Holden; Crew Queen Pamela Robbins, and your own favorite Crew Minion Yi Shun Lai spent some time in each other's company over the long weekend. 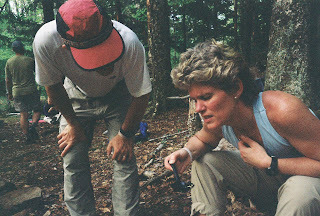 Under the tutelage of Plymouth State University's incomparable Christian Bisson, we were properly schooled in Leave No Trace standards and their uses insofar as adventure racing goes. 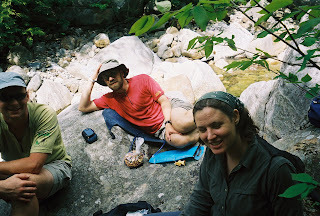 Christian taught us everything we need to know about Leave No Trace, and then some. Read on for more. Chris picks up Yi Shun and Jim in Boston. We realize that Chris packs for a camping trip like a drag queen summering in Rio: Four enormous bags and a man-purse. Chris defends the haul by saying he "packed for every activity possible," at which point our Crew Queen, cramped in the front seat with Chris' man-purse, pulls from it his reading material: a 700-page tome of poker instruction. The Crew Minion realizes that she is in for a long drive, as Jim and Chris instantly start gabbing about poker strategy and Chris reveals that he played poker for an insane amount of time on Tuesday night, thereby leaving him so tired that he sleeps through Pamela's arrival in Boston Wednesdsay night. Pamela is remarkably forgiving. We are joined in the clasroom by the incomparable Amber Rethwisch, an Americorps volunteer who quickly became a part of the ARFE family and spent most of the camping trip in a bug net. She was smart. Amber, in her de rigeur bug net. We wanted to take her home with us, she was that cool. We spent this day in the classroom learning about the background of Leave No Trace, handing out homeword assignments, and packing our food. And I don't just mean Mylar bags of dehydrated onion soup, or beef stroganoff, or whatever, I mean food. Christian is a Leave No Trace instructor in the NOLS tradition, which means that he wants to teach us how to really cook in the backcountry. He had us carry out well over 55 pounds worth of nourishment: cake- and pizza-dough flour, dehydrated eggs, quinoa, pasta, bell peppers, mushrooms, onions, elephant garlic, cumin, lentils, oatmeal, chai, tea,...Your Miss Midwesterly looked at the haul and noted somewhat drily that the stuff going on this camping trip well outweighed what was in her refrigerator at home here in Chicago, which amounts to a bag of baby carrots for Sprocket, fifteen beers, and Gatorade. We learn about LNT's first principle, Plan Ahead and Prepare. We spend the first night in PSU's Loon Lake cabin, which is on a lake (duh) and affords the Crew Minion some valuable swimming time. Chris and Crew Queen go rock climbing. Crew Minion, Jim, Kathy, and Jeff head out to dinner at a terrible restuarant, but the company is good enough to drown out the awful service and so-so food. We return to find the cabin overrun with college students who are simultaneously swilling gin and cranberry juice (the mixologist in the Crew Minion cringes) and talking about the day they spent jugging ropes. The Crew Minion wonders how eleven people are going to share one shower, and then she realizes that only one of the college students has intentions to shower. Beds in cabin are squeaky-squealy like stuck pigs; Jeff is a snorer; Jim is a moaner; Chris has a nightmare and tries to punch his way through the wall to Jim. Pamela shushes Chris; Crew Minion spends night stewing neurotically and uselessly over horrible service in restaurant. All in all, a restless night, and the college students are the only ones who get any sleep. Four of us head out to Dunkin Donuts to get some coffee and donuts; Pamela and Chris, both health-and-environment-conscious vegans, opt out. 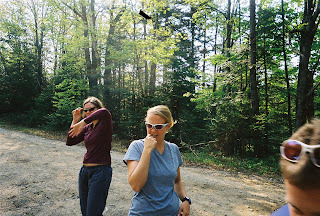 We meet Christian and Amber at the PSU parking lot, divide up into cars for the ride to the trailhead, get out of the car, and realize quickly that the Black Flies in the region like to chew on people. Between packing, swat at bugs; kill several triumphantly. Christian looks horrified and gently shoos bugs away from his face. Amber, left, sans her bug net, cringes from a dive-bombing kamikaze black fly. Pamela picks at one that gets stuck between her teeth. Chris crashes the photo. Christian had notified us before that he'd be sure to shorten our hiking days to making time for training in the afternoons: the first day's hike is a whopping one-point-five mile! We split into two group to lesson the impact on the trail: four and four, traveling about ten minutes apart. It's part of Amber's lesson on traveling on durable surfaces, Leave No Trace's second principle. 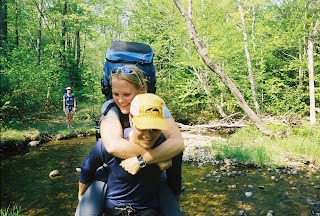 Chris looks like he needs exercise, so Pamela and Crew Minion indulge him by letting him carry us over a stream. Crew Minion is so pooped from the trip that she uses the time on Chris' back to hydrate. 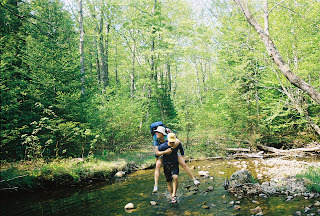 Chris looks happier carrying us over a stream, doesn't he? At camp, a lovely idyllic site set by a stream, Christian and Amber help us to pick durable sites to set our tents up on. There's an existing "social" trail leading from the kitchen area to the tents, so we don't have to create a new one. We set the kitchen area well away from the tent area, to reduce impact. We set up two kitchens, ostensibly for the same reasons, but we all know it's because the veg-heds, of which there are four, want nothing to do with heathen meat-eaters. 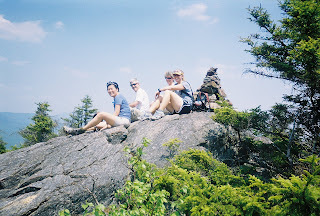 Chris goes for a run up Mount Israel; Pamela gamely jogs it; Crew Minion, Jeff, Kathy, and Jim hike it and sit up top for a little while, baking and enjoying a Blackberry-less life. Mount Israel, at 2380 feet elevation, is bigger than anything the Midwesterly folks have seen in a long time. After our hike, everyone converges on the swimming hole for a little dip, and we converge on a mis-placed bridge to exercise Leave No Trace principle number four: Leave What You Find. Someone's moved the bridge over swampy water to a completely unreasonable location, so we move it back to where it won't create a new trail and where it'll be better served. Chris loses a Chaco in the muck; Crew Minion remembers why she dislikes swamp mud, and everyone goes back to camp, feeling like we did something good. Dinner is quinoa, lentils with cumin, tuna steaks for the meat-eaters, and tempeh for the vegheads. Kathy and Jeff struggle with the quinoa for a little while until the Crew Minion sticks her spoon in the pot, eats a mouthful, and pronounces it ready. Kathy and Jeff struggle over the quinoa. Jeff shows us how to build a mound fire with sand from near the swimming hole, which we haul back to the hole after we're done; Jim teaches a sample Leave No Trace awareness clinic in the style we'd employ at a race, and we give him feedback and brainstorm, using Amber's teaching experience, for ways to reach more racers and people. Tune in tomorrow for Days Three and Four.